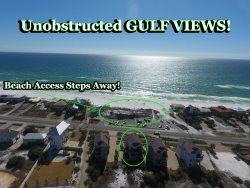 '642 Western Lake' Located in the Desirable Park District, Easy Walk to Beach & Seaside + 4 Bikes! This beautiful home, in the sought-after Park District of Watercolor, is in the perfect location! The beach is a short walk away and you are just two streets away from Seaside! As you enter through the front door, your eyes are drawn to the amazing artwork that is displayed. These one-of-a-kind pieces were created with Watercolor in mind! The soothing tones throughout the home create the perfect ambiance for relaxation and rejuvenation of the soul. The living room and dining area open to the Chef inspired kitchen, which is perfect for entertaining with all the 'details' in mind. It's truly any Chef's dream and equipped with all the gadgets you could need! It includes a large breakfast island with seating, a 48' stainless gas Wolf range stove with a grill, Dacor Commercial exhaust system, 36' Sub Zero refrigerator, Bosch dishwasher, and a wine cooler. The kitchen and bathrooms have custom teak and bamboo cabinets, and the floors throughout the home are also reclaimed teak, all imported from Java Indonesia. One of the two master suites is on the first floor and offers a king sized bed, flat screen tv, attached luxurious bath, and his and hers closets. The bathroom features double vanities with teak countertops, spacious tiled shower, and large soaking tub. There is a large front porch off the living room with outdoor seating to relax and enjoy a morning cup of coffee. The large screened back porch with a large dining table is perfect for dining al-fresco. Just off the screened back porch is a gas grill, custom built outdoor shower and beach toys for the little ones! There is also a laundry room with an LG washer and dryer to complete the first floor. On the second floor, you'll find a second master suite boasting a King-sized bed, flat screen tv and an impressive master bath with all stone walls, and built in vanity. The large private balcony with two lounge chairs is a relaxing retreat after a fun filled day at the beach. A guest room with a Queen-sized bed with a flat screen tv is also on the second floor and attaches to the shared hall bathroom. The shared bathroom features a double vanity and a shower/tub combo. The 4th bedroom has two twin sized beds and a flat screen TV. An additional seating area on the second floor offers a large flat screen TV and a love seat. A half bath is located just off the seating area. There is also an additional screened balcony off the seating area with outdoor seating. This home comes with 4 complimentary bicycles to make exploring WaterColor and neighboring communities a breeze! 3) 4 bikes are included in the rental. To utilize, waiver must be signed and received before code provided. Please contact Saxon with Bikes 4U 30A at 850.399.1230 with any bike questions. Really enjoyed working with Jessica and would absolutely work with her again. Amazing vacation and so missing our beach vacay already! Jessica was wonderful to work with. Small issues were solved immediately. My husband and I booked this house for a family vacation. We brought our two daughters and their husbands and our two year old grandson. Everyone loved the house, community, beach and all the amenities. It was an awesome family vacation! Very knowledgeable, prompt and courteous in replying to our questions. One of the very best properties where we have stayed, and we have been coming to Watercolor/Seaside for 6 years. Thank you!